There is definitely no stopping the spokesperson of humanity from flying close to the sun. Just recently, American composer and playwright, Lin-Manuel Miranda has confirmed that he is currently working on a new musical inspired by the story of Presidential Spokesperson, Harry Roque—as per Duterte’s order after he stopped Miranda’s award-winning musical, Hamilton, from having its run in the country. Just by Miranda’s confirmation, the hype is already unimaginable. Filipinos are huge fans of plot twists and whose better story to tell in terms of plot twists? From being a human rights champion—representing the victims of the 2009 Ampatuan massacre, the World War II comfort women, and the family of a slain transgender—Roque now defends Duterte and his salvage administration to the world. His words now border on senseless— he slams the Vice President, Chief Justice, Ombudsman, an opposition senator, and UN rapporteur as he calls them “expiring women” while he praises the dictator’s daughter and a blogger turned Assistant Secretary of PCOO as the model women for Filipinas. The lawyer also seemed to have a complicated relationship with the truth— in his world, fake news is necessary to know what’s true. “A man versus himself conflict, its irony and hypocrisy, challenges me,” said Miranda on to why he decided to take this story. As Roque said in an interview after he rejected the idea of him getting the lead role, personal choice is “not a valid reason” to cast someone who can’t sing in a musical. Of course, when it was revealed that Duterte himself ordered the casting, Roque changed his tune. “Well, if that’s what the President wants, then who am I to refuse the call of service? If that will make the 16 million voters, I mean theatre-goers happy, by all means I’ll do it,” he expressed while blushing. “Harry will fit the bill because like me, he also has a fast, dirty mouth,” President Duterte says, as he explains more about his decision. It was also the exact same words he said when he appointed Roque as his spokesperson. Icarus will be a sung and rapped-through musical with a brilliant play of hip-hop and traditional show tunes— nothing that a fat mouth can’t handle! In his solo press conference organized by Thinking Pinoy blogger RJ Nieto, Harry Roque was cocksure about the success of the musical. It is a given that the talented Assistant Presidential Communications Secretary, Mocha Uson, will join the cast. “I’m pretty sure the lady misses performing. This is just a breather for her from all the issues she has faced in the name of freedom of speech and service. Also her number of followers assures the success of this thing.” Roque said. It was revealed that the late dictator’s daughter, Imee Marcos, who Harry described as “down to earth” and a relatable “babaeng bakla” will finance the musical—all thanks to the Filipino taxpayers. Isabelle Duterte, the granddaughter of the President who dreams to be an actress, also has a sure role in the musical. Although it wasn’t yet disclosed what role she will be playing, the 18-year-old posted a photo shot in Malacanang with a caption confirming that they will be sponsoring Hermes gifts for the audience on the first three days of the show. “I don’t think it should be an issue,” Harry said in defense of Isabelle Duterte’s casting. “The whole musical was the President’s idea, he is entitled to cast whoever he wants to see in the show, he opted not to cast himself but perhaps his relatives, his own grandchild can star in it,” he added. Harry is a blabbermouth and so is the President, which means there will be rudeness and misogynistic jokes on the play that would require the audience especially the women to just laugh. “You know, sometimes, these feminists are really a bit OA. I mean, it’ll be funny. Come on. Just laugh,” he said. For its first week, Icarus will be shown in Malacanang Palace. According to Roque, the Palace is the President’s house and so he is entitled to do whatever he wants to do in there. With this, it is expected that Rappler, especially journalist Pia Ranada is not welcome to see the show. 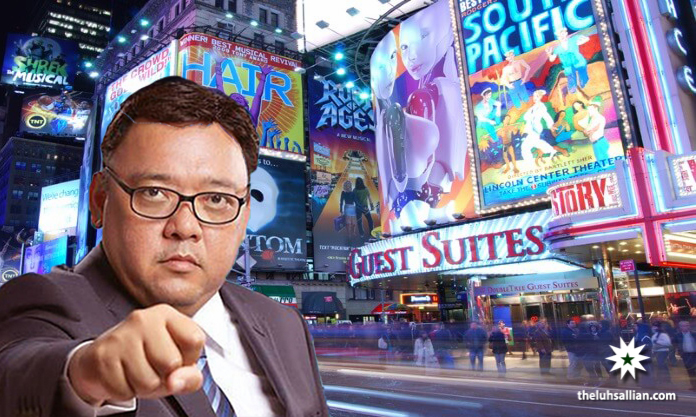 To ensure successful reviews of the show, aside from the huge online hype, Roque still threatens to throw adobe ‘hollow blocks’ at the muckrakers—just like how he threatened the stubborn critics of Duterte. Harry Roque is the perfect person for the job, or for both jobs rather; as the Presidential spokesperson and as the Star of Icarus. Roque’s intention to run for the Senate is no secret and just like how Icarus has flown too close to the sun, Harry is achieving too much too soon in his political ambitions. He risked his credibility and used his intelligence for the foolish. The defender of the powerless now defends the strongman who has demonized human rights. From someone whose words can build worlds, Roque now speaks without rhyme or reason—all in the name of ambition. Roque might just get there, but before he can even get closer to the sun, he is already headed for his downfall.